Building the quality of investigative reporting. To what extent has SIM a) improved the quality of the reporting of new media outlets and sources and contributed to their growth; b) built the quality of investigative reporting in BiH; and c) developed local capacity, expertise, and practice in media policy, law, and literacy? How efficient/effective were programmatic and management practices implemented in SIM, particularly the small grant mechanism? 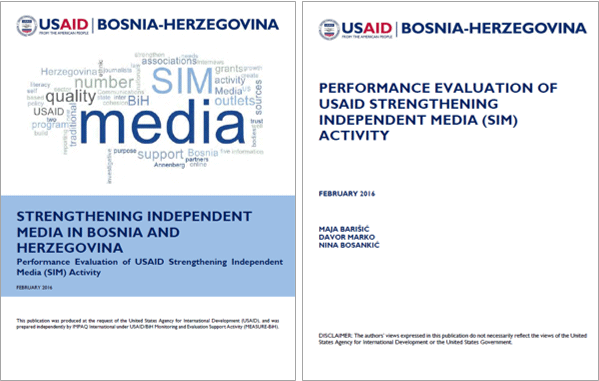 How well did local media partners, particularly online media partners, and other beneficiaries such as universities, students, and policy fellows accept SIM’s assistance, and did they find it well tailored for BiH’s needs? To what extent did SIM develop and communicate messages that accurately conveyed SIM’s main goals, according to the donor, partners, stakeholders, and beneficiaries? We used a combination of quantitative and qualitative research methods to examine the performance of SIM. The methods include document review, key informant interviews, focus group discussions, expert panel, mini-surveys, and quantitative data analysis. The evaluation team designed the interview guide to fit each of the evaluation’s objectives, and included specific questions to assess performance, as well as to address important contextual aspects.